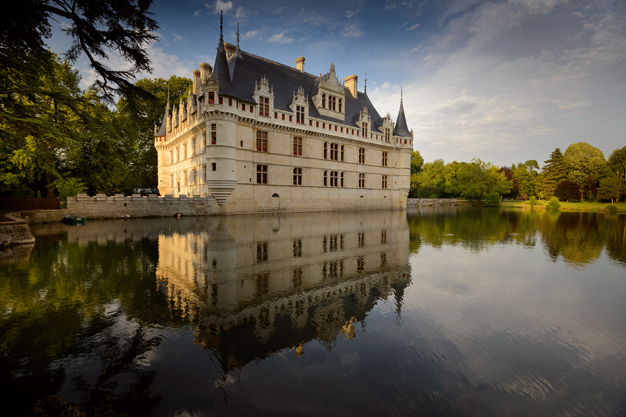 The Château d'Azay-le-Rideau is built on an island between two branches of the River Indre. This exceptional site, which gives so much charm to the château, has rich flora and fauna of which the various owners have taken advantage. When he bought the castle in 1791, Charles de Biencourt, a botany enthusiast, wanted to transform the regular garden into a landscaped park. The gardens, known as "English", with their irregular plots, various forms of plants and the terrain features created, reflected a natural and uncontrolled conception of nature. The site topography of Azay and the abundance of water were ideal for such a project. Revolutionary events pushed back the creation of the garden, the project site of which should have been underway at the death of Charles de Biencourt in 1824. His son, who inherited the property, pursued it Trees, exotic species for the time (Sequoia, Cedar, American tulip tree) were planted in the park. Winding alleys were made which provided pleasant and surprising viewpoints of the château. The park was planted with what were then exotic species: precious and foreign origin shrubs (North America, South America, China, Asia) formed a range of choices, for which the owners did not hesitate to spend major sums of money on in fashionable nurseries. From January 2014 to April 2015 the Centre des monuments nationaux conducted an extensive park renovation campaign. Based on archive documents, the chief architect of historical monuments redesigned the alleys as they were in the 19th century and replanted some species. 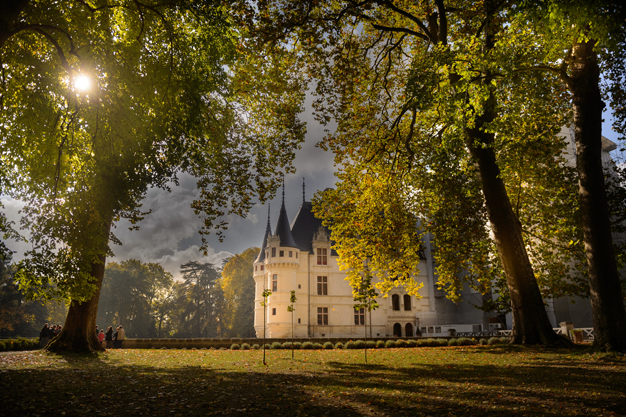 The architecture of Azay is part of a region and a singular landscape: one cannot fully appreciate the château without the setting of its personal park. > Dragonflies: Sixty dragonfly species, some of which are endangered, are listed in the Indre-et-Loire region. 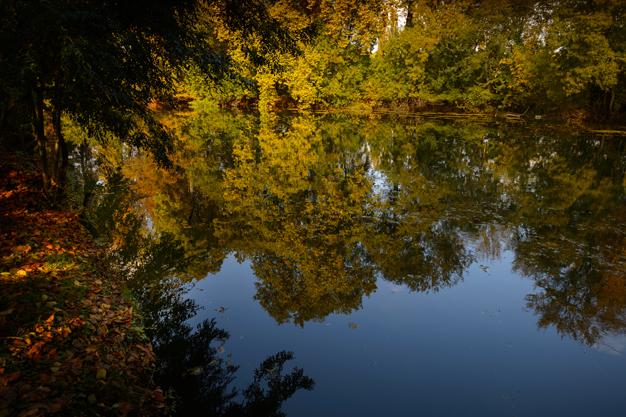 The water mirror offers an ecological framework for the installation of these insects: as such, the Centre des monuments nationaux is participating in a scientific study on their displacement. > Bats: The attic of the castle is home to a bat colony of a rare and protected species, the Great Mouse-Eared Bat. The Azay colony has about fifty individuals, nesting from April to October. Adjustments were made so that the bats are not disturbed by the visitors moving around. During the day, an infrared camera placed in the nest makes it possible to observe them. The roof restoration work schedule was determined based on the nesting period so the life cycle of the bats is disrupted as little as possible. > Ginkgo biloba: The Ginkgo biloba or maidenhair tree is a species of Chinese origin which arrived in Europe in 1730. The first cuttings of ginkgo spread in France at the end of the 18th century: in the early 19th century, it was still a rare and sought after species. > American tulip tree: This species, native to the United States, was introduced in France in the early 18th century. > Sequoia: sequoia is a conifer from America, introduced in Europe in the second half of the 19th century, shortly after the discovery of the species. If French sequoias are smaller than those in America it is because they are much younger and have not yet reached their maximum size. > Atlas Cedar: The Atlas cedar is a conifer with a majestic and wide silhouette. The species is native to North Africa. 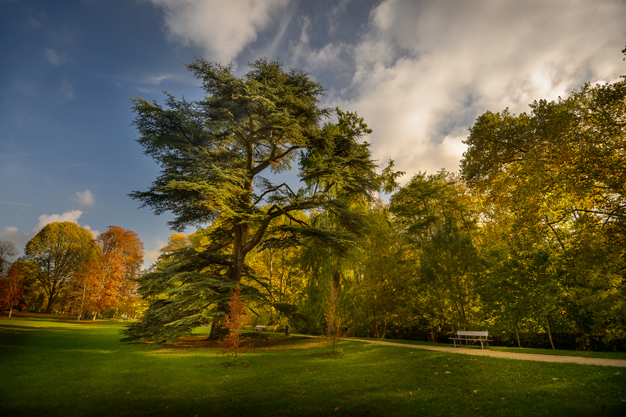 Its introduction in France dates from 1839: the tree has quickly found its place in the parks of the châteaux where its appearance rivals the monumentality of the building. > Bald cypress or Louisiana State tree is native to the southern United States. It thrives particularly in wetlands: the Park of Azay is thus particularly conducive to its growth. terrain particulièrement propice à sa pousse.